Quality Cabinets® offers several depths of wall, base and vanity cabinets – all in a wide variety of sizes, wood species, door styles and color combinations (more than 500, in fact) and all at an incredible value for the money. Our optional upgrades and decorative accessories allow you to “customize” a room to reflect your personal style – and achieve beauty and function your way. 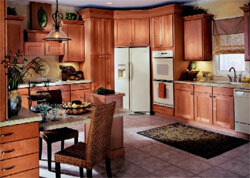 Quality Cabinets® products have a rich, natural beauty you’ll be proud of for years to come. That’s because each tree produces its own characteristic color and grain, as individual as a fingerprint. These variations create the distinctive beauty and interest found in natural wood. We hope you will appreciate and enjoy these natural characteristics. Many of our stains are hand-wiped to bring out the natural luster and character of the wood. A catalyzed sealer and topcoat provide superior protection, making them durable and resistant to water and most household chemicals for years of lasting beauty. The Quality Story is one of more than 30 years’ experience. When you’ve been building cabinets as long as we have, you learn it doesn’t pay to cut corners. So we do it right – with solid kiln-dried hardwood face frames that give strength, squareness and rigidity to every cabinet we make. Quality Cabinets® products are certified by the Kitchen Cabinet Manufacturers Association (KCMA) and exceed or meet industry standards for construction and performance. Look for the KCMA seal on the inside of your Quality Cabinets®.